Equipment: satellite TV; DVD; washing machine, iron/ironing board; electric heating; underfloor heating (not available in all rooms). Please note: Non-smoking house. detached house, 6 people, 4 room/s, 3 bedroom/s, 1 bathroom/s, approx. 105 m², 2 floor/s, year of construction 2009. Bedroom 2: (floor 1): double bed (1.60 m wide, 2.00 m long). Bedroom 3: (floor 1): single bed (0.75 m wide, 1.90 m long), single bed (1.20 m wide, 2.00 m long). Important information: maximum occupancy: 5 adults and 1 child(ren). Kitchen: Kitchen/ cooking equipment: 4 ceramic hobs, oven, microwave oven, dish-washer, refrigerator, coffee machine, water boiler, toaster, freezer approx. 65 litre. in the living room (ground floor). Living room: (ground floor): furniture suite, wood-burning stove, exit. From the living room stairs to upper levels. Bathing jetty/bathing: bathing place (private use) in approx. 20 m.
Estate: (private use): approx. 9000 m², partially surrounded (fence), meadow. On the neighbouring estate sheep. 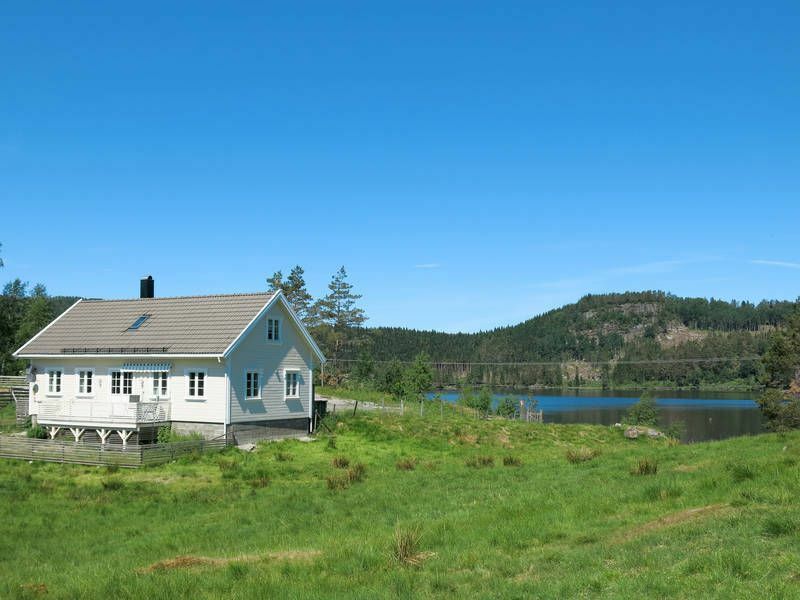 Fishing: good fishing possibilities, in the lake Brådlandsvannet, fishing license provided by the owner (free of charge). Information on the boat(s): Rowing boat (approx. 40 m distant; included). Rowing boat (approx. 320 m distant; included). Canoe (approx. 40 m distant; included). Situation: rural, altitude 184 m, lake-view, view of Brådlandsvannet. Arrival: Airport Kristiansand Kjevik in approx. 90 km. Ferry port Kristiansand in approx. 75 km. Train station Audnedal in approx. 16 km. Beach/waters: Lake (without crossing the street) in approx. 30 m (Brådlandsvannet). Lake in approx. 320 m (Rianstjønn). Bus stop: Bus stop Tryland in approx. 3.6 km. Nearest neighbour: Nearest neighbour in approx. 270 m.
Next village/town: Center Konsmo in approx. 12 km. Kristiansand in approx. 75 km. Mandal in approx. 34 km. Shopping: Next shopping possibility (Konsmo) in approx. 12 km.